The job of the artist is to create mystery. Did I ever chuckle when I came across this quote. Busted! Read on to see what a secretive lot we photographers can be! This is my longest blog post to date BUT if you have ever been disappointed by NOT seeing the northern lights when others have raved about or captured fabulous images of them AND you live below 50 degrees latitude…read on! If you can tolerate the ground-work laying information in the next couple of paragraphs without your eyes rolling back in your head I will then get to why you may have seen the aurora borealis and not even known it! Trending this past week were photos of the aurora borealis dancing in the night skies over North America and other parts of the world as well. There are people FAR more adept at explaining what these light displays are but basically it begins with a CME or coronal mass ejection. This is a cloud of gas ejected from the surface of the Sun. When these winds of charged particles collide with Earth’s magnetic field it excites those atoms causing them to light up. For viewing purposes the important thing to know is the global geomagnetic storm index or KP number and it ranges from 0-9, with 9 being the highest. Using this number enables you to see if there is a possibility of seeing the aurora in your location. Spaceweatherlive.com is a wealth of information on this number and how to find your value. This week I saw some very beautiful images of the northern lights shot during the early hours of June 23, 2015. The KP index was predicted to be between 7 and 8 and for my viewing purposes in Northern Idaho, I need between a 5 and 6 to give me a good chance of seeing lights. The evening did not disappoint and along with the greens I captured with my Nikon some lovely spiking pinks dance across the night sky along the edge of my pasture. I am fortunate to live in a place with dark skies and little light pollution which greatly improves the chance of seeing these. You might have noticed that I did not say that along with the greens I saw some lovely spiking pinks. What my eyes saw when I walked outside was this..
but I knew that what I was seeing was the northern lights because of a chance discovery that I blogged about in March here. I suppose it is the job of the artist to create mystery but I have read too many comments from people bitterly disappointed after getting up to witness this altogether infrequent sight at my latitude to NOT provide an explanation and hope to those who have seeing this on their bucket list. I grew up in Edmonton, Alberta, latitude 53 degrees, and recall seeing the aurora borealis in all of its colorful glory. After many years away in more southerly climes we moved north once again to Idaho, latitude 48 degrees. I was puzzled and disappointed that while others were out in my same area capturing beautiful northern lights shots…I never once saw them but I was looking for color. After my March discovery thorough research into this showed me that the human eye uses rods and cones. In the retina cones perceive color, work in bright light, and are used in the day. Rods perceive light and shadow and are used at night. Camera sensors in the DSLR’s do not have these limitations so they capture the full range of color and light. The simple explanation is as you go below 50 degrees latitude, the northern lights are weaker and will to most people be viewed more as shifting patterns of light in the white to gray range and NOT the colors that the DSLR is capable of capturing. I would expect that eyes differ so possibly and depending on KP strength some people might still see some color. Travelling further north will diminish the differences between what your eyes see and what the camera captures. The next time the KP index is high head out away from the city lights and enjoy searching the night sky and if you see dancing patterns and sheets of light you will have watched the aurora borealis! Wow, it’s an amazing view.. 🙂 nice shot.. Thank you Jackie, always a thrill to catch these. Thank you so much for that explanation. It also helps me to understand why you are so good at what you do. And it’s a beautiful picture. Thanks, and not impossible Wade with a very strong storm like the one back in March just not too likely. If I ever see one shaping up for a possibility I will let you know! 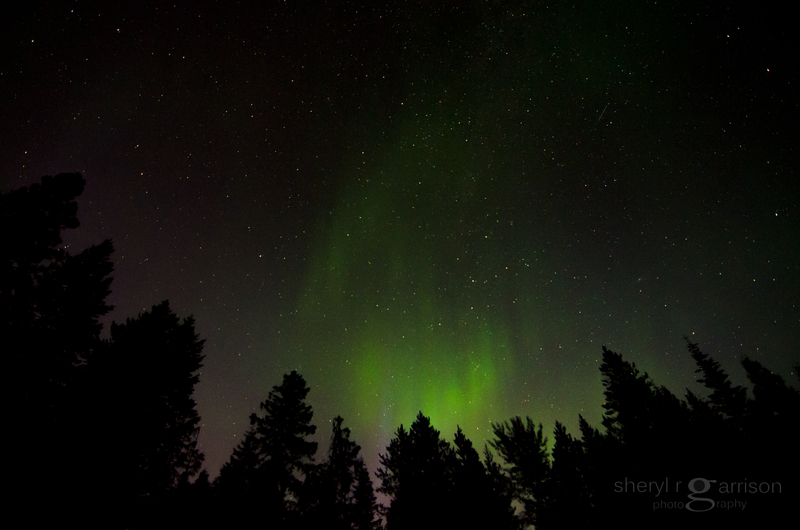 We’ve seen some fairly active Northern Lights here (53 degrees) but they seemed only to be green. From your explanation, a camera would have seen more colours. That would have been interesting. Really appreciate the background information. Thanks, Sheryl! That’s possible but I do know that the colors depend on which gas is being excited by the electrons. Oxygen is more responsible for the greens and yellows and nitrogen for the blue and purple/reds. An interesting observation and one that I will have to explore in greater detail. We have limitations most of us are unaware of, it seems. Three cheers for DSLRs and a little extra knowledge! Your capture is stunning. Thank you Jenny! Last March’s experience with the northern lights was one of the few times that I have ever been really surprised by a photo. Now I am just pleased that I can still see these from time to time and capture them in color! Interesting blog, thankyou. I live in Ne Zealandcso we get the Southern lights..I haven’t photographed them personally..😀 but they have been spectacular lately!! Not sure how this applies in the Southern Hemisphere but it sounds like you see full color with the naked eye? This particular storm is ending but until the next one! An interesting post, Sheryl, and a wonderful photo. And I’m giving you respect for getting up at 2:30 am so you can go out into the dark and the quiet to capture these amazing pictures.